The submarine-cable installation works for the Asia Submarine-cable Express (ASE) cable system commenced in October 2012 and were completed in January 2013. This is the Post Project Water Quality Monitoring Report presenting the post-project water quality monitoring conducted during the period from 4 February 2013 to 20 February 2013 in accordance with the Monitoring and Audit Manual (EM&A Manual). Nine monitoring events (days) were scheduled between 4 February 2013 and 20 February 2013, with three days for each of Zone A, Zone B and Zone C. Monitoring events at all designated monitoring stations in the three zones were performed on schedule. In general, the dissolved oxygen levels recorded during the Post Project Monitoring period were mostly higher to the results obtained during the baseline monitoring period. Turbidity and suspended solid levels in Post Project Monitoring period were also slightly increased at all designated stations including the control stations. After detailed analysis, it is considered that the overall changes in turbidity and SS were driven by natural fluctuations rather than the marine works of the Project. Upon completion of the Project, overall water quality at the impact stations in Zone A, Zone B and Zone C was found to be similar to that at control stations, which was higher in dissolved oxygen, turbidity and suspended solids when compared with the baseline data. Given the fact that control stations are sufficiently far away from the cable alignment and water quality at these stations could not be affected by the Project, it is concluded that the overall variations in turbidity and SS reflected a natural phenomenon. Hence, no deterioration of water quality was observed other than natural fluctuation. The impact of the marine works of the Project on water quality is considered to be negligible. 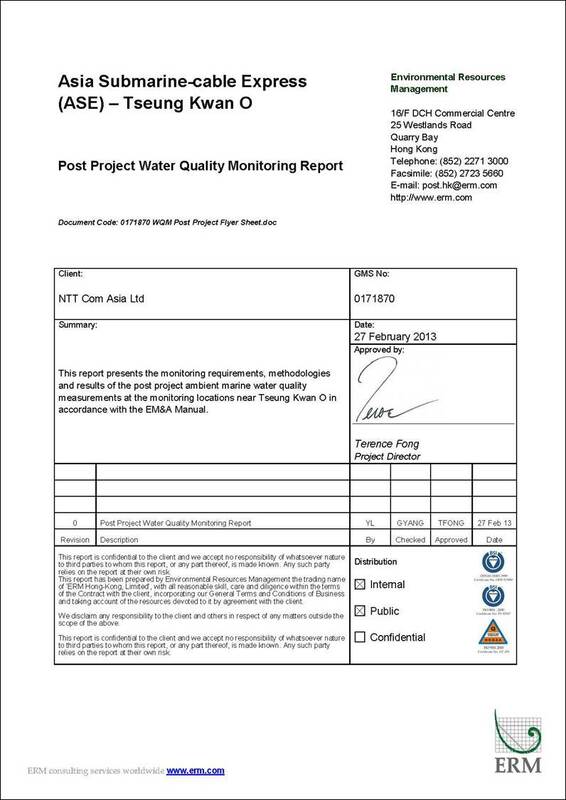 This is the Post Project Water Quality Monitoring Report, which summarises the results of post-project water quality monitoring finding as part of the EM&A programme during the reporting period from 4 February 2013 to 20 February 2013. The Post Project Monitoring results are used to compare with the baseline monitoring results in order to investigate the impact of the project works on water quality in the vicinity of the project site from Tseung Kwan O eastward to the boundary of HKSAR waters. Summarises the monitoring parameters, monitoring programmes, monitoring methodologies, monitoring frequency, and monitoring locations. Summarises the implementation of environmental protection measures during the reporting period. Summarises the monitoring results obtained in the reporting period for Zone A, Zone B and Zone C.
Presents the key findings of the Post Project Monitoring results. NTT Com Asia (NTTCA) proposed to install a telecommunication cable (Asia Submarine-cable Express (ASE) cable) of approximately 7,200 km in length, connecting Japan and Singapore with branches to the Philippines, Hong Kong SAR (HKSAR) and Malaysia. NTTCA is responsible for securing the approval to land the ASE cable in Tseung Kwan O, Hong Kong SAR (HKSAR). The landing site is at a new Beach Manhole (BMH) and the cable is ultimately connected with a Data Centre in Tseung Kwan O (TKO) Industrial Estate. From Tseung Kwan O, the cable extends westward approaching the Tathong Channel. Near to Cape Collinson, the cable is approximately parallel to the Tathong Channel until north of Waglan Island where the cable travels eastward to the boundary of HKSAR waters where it enters the South China Sea. 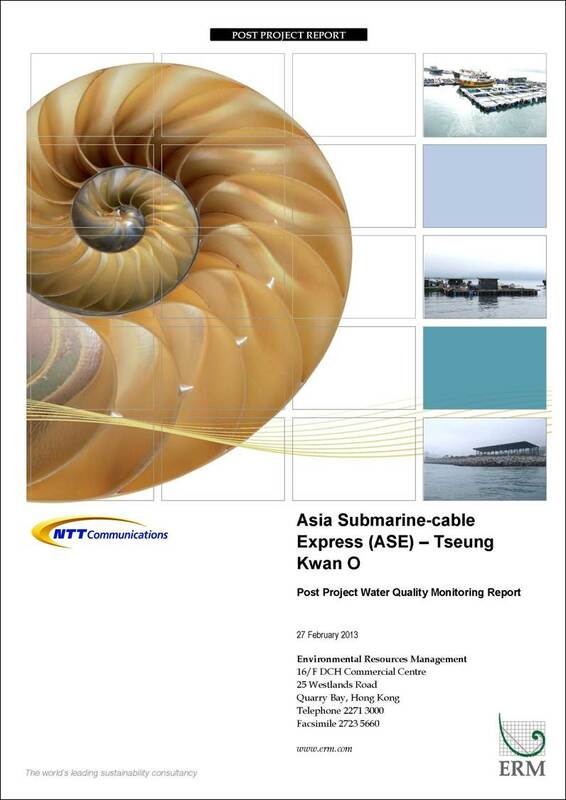 The total length of cable in Hong Kong SAR waters is approximately 33.5 km. A map of the cable route is presented in Figure 2.1. Pursuant to Condition 2.4 of the EP, an environmental monitoring and audit programme as set out in the Environmental Monitoring and Audit Manual (EM&A Manual) is required to be implemented. In accordance with Section 2.3 of the EM&A Manual, Post Project Monitoring of marine water quality should be undertaken after completion of the cable installation works at the same stations as baseline monitoring in Zone A, Zone B and Zone C, during mid-flood and mid-ebb tides. Baseline Monitoring was conducted in Zone A between 29 August 2012 and 3 September 2012 and the results were presented in Baseline Water Quality Monitoring Report (Zone A). Baseline monitoring for Zone B was undertaken from 17 September 2012 to 21 September 2012 and Baseline Water Quality Monitoring Report (Zone B) presented the results of the monitoring data in Zone B. Baseline monitoring was as well as carried out in Zone C between 24 September 2012 and 28 September 2012 and the results were presented in Baseline Water Quality Monitoring Report (Zone C). Impact Monitoring in Zone A, Zone B and Zone C commenced on 8 October 2012 when the cable installation barge started to work in Zone A. The cable installation works were completed on 29 December 2012 and the impact water quality monitoring ceased subsequently. All marine works for the cable installation was completed in January 2013. In accordance with the EM&A Manual , Post Project Water Quality Monitoring Report should be conducted within one month after completion of the marine works in Zone A, Zone B and Zone C. This report presents the data obtained from Zone A (Figure 2.2), Zone B (Figure 2.3) and Zone C (Figure 2.4). Results of the Post Project Monitoring data have been compared against the results of the baseline water quality monitoring in each zone. The cable installation ran from Tseung Kwan O, and extended eastward approaching the Tathong Channel. Near to Cape Collinson, the cable is approximately parallel to the Tathong Channel until north of Waglan Island where the cable travels eastward to the boundary of HKSAR waters where it enters the South China Sea. The alignment of the cable is illustrated in Figure 2.1. In accordance with the EM&A Manual, marine water samples for Post Project Monitoring were collected at the same stations as baseline monitoring situated around the submarine cable works in Zone A, Zone B and Zone C. The locations of the sampling stations are shown in Figure 2.2 – Figure 2.4. · G3 is a Gradient Station between F1 and the cable alignment. · G7 is a Gradient Station between E1 and the cable alignment. · G6 is the Gradient Station between E5 and the alignment. The co-ordinates of the above monitoring stations in Zone A, Zone B and Zone C are listed in Table 3.1. Table 3.2 summaries the equipment used for the post project water quality monitoring. The water monitoring was carried out on nine occasions (days), with three occasions (days) for each zone (Annex A). The intervals between two sets of monitoring were not less than 36 hours. The water quality sampling was undertaken within a 4 hour window of 2 hour before and 2 hour after mid flood and mid-ebb tides. The tidal range selected for the Post Project Monitoring was at least 0.5 m for both flood and ebb tides as far as practicable. Reference were made to the predicted tides at Tai Miu Wan, which is the tidal station nearest to the Project Site, published on the website of the Hong Kong Observatory (). Based on the predicted tidal levels at Tai Miu Wan, the post-project water quality monitoring was conducted between 4 February 2013 and 20 February 2013, following the schedule presented in Annex A. Schedule for Post Project Monitoring has been submitted to the Contractor, Independent Environmental Checker (IEC), Engineer Representative (ER) and Environmental Protection Department (EPD) one week prior to the commencement of the monitoring works. All in situ monitoring instruments were checked, calibrated and certified by a laboratory accredited under HOKLAS or any other international accreditation scheme before use, and subsequently re-calibrated at monthly intervals throughout all stages of the water quality monitoring. Responses of sensors and electrodes were checked with certified standard solutions before each use. Water samples for SS measurements were collected in high density polythene bottles, packed in ice (cooled to 4°C without being frozen), and delivered to a HOKLAS laboratory as soon as possible after collection. 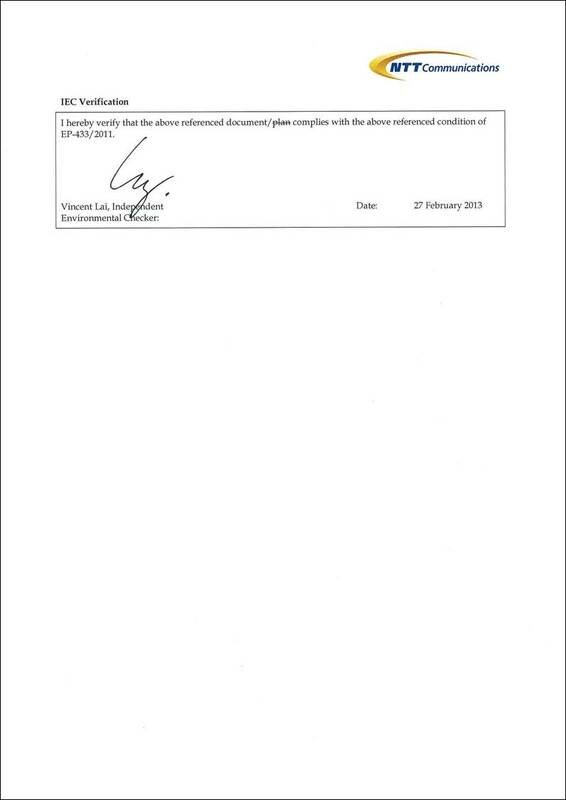 The QA/QC details were in accordance with requirements of HOKLAS or another internationally accredited scheme (Annex B). · Prevention of leakage from construction equipment to reduce the runoff entering the marine waters was incorporated as part of good working practices. A total of nine monitoring occasions (days) were scheduled in the reporting period in February 2013 (Annex A). Monitoring occasions at all designated monitoring stations within Zone A (conducted on 4, 6 and 8 February 2013), Zone B (conducted on 15, 18 and 20 February 2013) and Zone C (conducted on 14, 16 and 19 February 2013) were performed on schedule. No major activities influencing the water quality were identified during the reporting period. The Post Project Monitoring data are presented in Annex C and compared with baseline monitoring results in Figures C1-C18. As shown in Figures C1-C18, post project monitoring results in Zone A, Zone B and Zone C have similar trends in all measured parameters in particular the level of dissolved oxygen, level of turbidity and suspended solids. Therefore, monitoring results of these three parameters are discussed together as follows. The levels of dissolved oxygen measured during the post-project reporting period in all of the three zones at different sampling depths were higher than those obtained during the baseline monitoring periods. Elevation of dissolved oxygen concentration was detected at all the impact and control stations during the Post Project Monitoring period. DO levels recorded at the impact stations were of similar magnitude to those measured at the control stations (Figures C1, C2, C4 and C5 for Zone A, Figures C7, C8, C10 and C11 for Zone B, and Figures C13, C14, C16 and C17 for Zone C). Levels of turbidity and suspended solids measured during the post-project reporting period showed similar trends (Figures C3 and C6 for Zone A, Figures C9 and C12 for Zone B, and Figures C15 and C18 for Zone C). Both of them in the three zones were elevated compared to those measured during the baseline monitoring periods. This occurred to all the monitoring stations including control stations C1, C2 and C3, which are situated at a long distance from the submarine cable alignment and are not likely to be affected by the Project works. Turbidity and suspended solids levels recorded at all the impact stations were of similar magnitude to those measured at the control stations during Post Project Monitoring period. Actually this overall elevation in the level of turbidity and SS has been discussed in the Fourth Weekly Impact Water Quality Monitoring Report, which concluded the situation as a natural phenomenon and an overall elevation in the background turbidity and Depth-averaged SS levels in nearby marine water rather than related to the marine works of the Project. Given this information, the overall changes in turbidity and suspended solids levels during the post-project reporting period in all designated stations including control stations compared to baseline are likely to represent a natural phenomenon rather than due to the marine works of the Project. It is considered that all these measurements were due to natural variations. 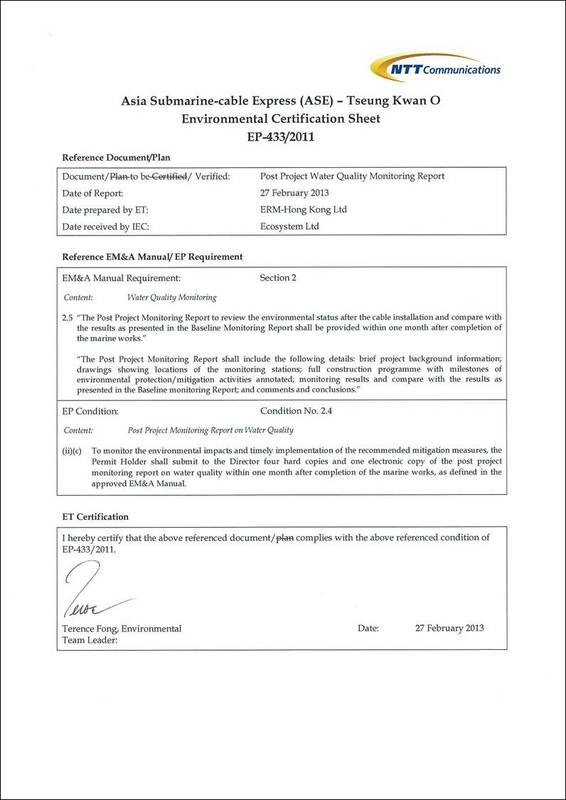 This Post Project Monitoring Report presents the EM&A work undertaken during the period from 4 February 2013 to 20 February 2013 in accordance with the EM&A Manual and the requirements under Environmental Permit (EP- 433/2011). DO levels, turbidity and suspended solids in Zone A, Zone B and Zone C conducted within one month of the completion of the Project was found to be generally elevated compared to that before the commencement of Project works (i.e. baseline data). After detailed analysis and comparison between the impaction stations and control stations, such overall variations in all sampling stations are considered to have been driven by natural fluctuations. It is concluded that no deterioration of water quality was observed and hence the effect of the Project works on water quality at the Project site is considered to be negligible.